Friendly Pilfer abilities are also Slay abilities. 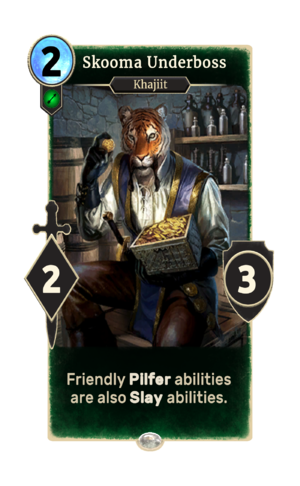 Skooma Underboss is a common Agility creature card. It is part of the Dark Brotherhood story set. A playset of the card is awarded for completing South Bridge. The premium version can only be obtained by soul-summoning, which is only possible after the completion of South Bridge. "Let's line up some customers." "They'll pay, one way or another!" This page was last modified on 27 February 2019, at 21:35.